Salep (Turkish: salep, sahlep; Persian: ثعلب‎‎, sa'alab; Arabic: سحلب‎‎, saḥlab; Albanian: salep; Azerbaijani: səhləb; Hebrew: סַחְלֶבּּ‎, saḥlab; Greek: σαλέπι, salepi; Serbian, Macedonian, Bulgarian and Bosnian: салеп, salep) is a flour made from the tubers of the orchid genus Orchis (including species Orchis mascula and Orchis militaris). These tubers contain a nutritious, starchy polysaccharide called glucomannan. Salep flour is consumed in beverages and desserts, especially in places that were formerly part of the Ottoman Empire. An Albanian salep merchant in Ottoman Üsküp (modern Skopje), 1907. 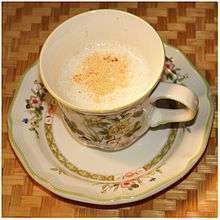 Salep was a popular beverage in the lands of the Ottoman Empire. Its consumption spread beyond there to England and Germany before the rise of coffee and tea and it was later offered as an alternative beverage in coffee houses. In England, the drink was known as saloop. Popular in the 17th and 18th centuries in England, its preparation required that the salep powder be added to water until thickened whereupon it would be sweetened, then flavored with orange flower or rose water. Substitution of British orchid roots, known as "dogstones", was acceptable in the 18th century for the original Turkish variants. The beverage sahlab is now often made with hot milk instead of water. Other desserts are also made from salep flour, including salep pudding and salep ice cream. The Kahramanmaraş region of Turkey is a major producer of sahlab known as Salepi Maraş. The popularity of sahlab in Turkey has led to a decline in the populations of wild orchids. As a result, it is illegal to export true salep. Thus, many instant sahlab mixes are made with artificial flavoring. Salep is also consumed in Greece, and it is usually sold on the streets as a hot beverage during the cold months of the year. It is extremely popular in many parts of the Middle East, especially the Levant. Families in Turkey drink the hot version during the winter time. The Ancient Romans also used ground orchid bulbs to make drinks, which they called by a number of names, especially satyrion and priapiscus. As the names indicate, they likewise considered it to be a powerful aphrodisiac. Of salep, Paracelsus wrote: "behold the Satyrion root, is it not formed like the male privy parts? No one can deny this. Accordingly magic discovered it and revealed that it can restore a man's virility and passion". ↑ "Ice cream threatens Turkey's flowers". BBC News. 5 August 2003. Retrieved 9 November 2015.